A decade later, we’re still a bunch of kids. After all the hype for TOY STORY 3, it should give me an actual buzz and an actual woody. Is it the best TOY STORY ever? 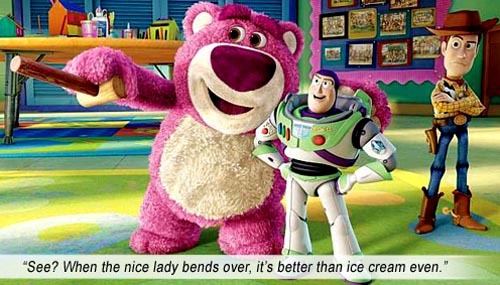 Well, that’s subjective as a pudding bear on Tuesday, but TOY STORY 3 is another plastic fantastic, wild child, great escape, life and death extravaganza that should thrill Bill Maher sufficiently. In TOY STORY 2 (1999), Stinky Pete mocked Woody, “Do you really think Andy is going to take you to college?” TOY STORY 3 is that very plot line – Andy, now a teen, is headed for college (played by the same voice actor who played him as a boy, John Morris – it’s been eleven years between sequels!). He packs Woody in his college bag (Stinky Pete was wrong! ), putting Buzz and all his other toys in a bag bound for the attic. Through a mixup, the bagged toys and Woody (trying to save them) end up at Sunnyside Day Care Center for kids. Kids who rend and rip and scream and crush kill destroy… you know, normal kids. Upon arriving at Sunnyside, Andy’s toys are in Toy Nirvana. Lotso the strawberry-smelling huggy bear (voiced by Ned Beatty) welcoming them with a whole slew of new characters, including Ken (of Ken’s Dream House fame, voiced by Michael Keaton – only in our elder years do we realize what a big gay metrosexual Ken has always been, with his fake tan, his ascot, his beach pants and that big smooth patch where his tools should be). Best friends Woody the cowboy (Tom Hanks) and Buzz the spaceman (Tim Allen) are at odds on whether to stay at Sunnyside. Woody leaves to return to Andy, while the other toys stay – and discover not only the barbaric kids, but that Lotso runs the Center like a mafia kingpin, a big doll-baby his muscle, Ken and some monster toys his enforcers. At night, Lotso imprisons Andy’s toys (Don Rickles as Mr. Potato Head, Blake Clark as Slinky Dog, Wallace Shawn as Rex Dinosaur, John Ratzenberger as Hamm) – and thus begins Woody’s quest to rescue them. Of course, the magic of every TOY STORY is not in its synopsis, but in the execution of the movie and the depth of its characters. And cuteness. Don’t forget cuteness. Death comes calling. The most serious circumstance they have ever faced, as Woody, Buzz and the gang inexorably slide slowly towards an iron smelter. Unlike any threats before it, this death is unthinking, unyielding, unable to be reasoned with like a fierce dog or a bad kid, it is overwhelming. And as they struggle vainly against the relentless landslide of scrap metal, Buzz, with his arm around Jessie, looks around and sees Woody. His look is final. It says there is no way out. And wordlessly he stretches his hand toward Woody. Woody takes it. Woody looks to the Potato Heads holding each other. He reaches out to them. They hold his hand. As all the toys join hands, there is no sound, but the relentless scream of metal melting in the maw of the furnace. No words, no tears, only an abiding, crushing love between them. They are not toys any more. They are our friends. We’ve lived with them for over a decade; now we’re going to die with them. pondering metaphysics: the nature of toy consciousness. To escape Lotso’s prison, Mr. Potato Head puts his face and limbs on a tortilla. And he is still “himself.” His parts can move discretely and retain his personality. Later, he puts himself on a cucumber! (Don’t get me started.) Likewise, Mrs. Potato Head can see through her missing eye, which is lost under Andy’s bed. So where exactly is the toy soul housed? Writers: John Lasseter, Andrew Stanton, Lee Unkrich, Michael Arndt. Starring: Tom Hanks, Tim Allen, Joan Cusack, Ned Beatty, Don Rickles, Michael Keaton, Wallace Shawn, John Ratzenberger, Estelle Harris, John Morris, Jodi Benson, Emily Hahn, Laurie Metcalf, Blake Clark, Teddy Newton, Bud Luckey, Beatrice Miller, Javier Fernandez Pena, Timothy Dalton. For the Kids – When they’re Adults. Kids will enjoy TOY STORY 3 because it’s a great movie, but when they re-watch it ten years from now, they will bawl their eyes out – not only for the nostalgia, but for all the complex minutiae and emotional connections they missed as kids. • As torture has become prominent in our lexicon of satire, Barbie (Jodi Benson) tortures Ken – tying him down and forcing him to talk by ripping up his metrosexual wardrobe. • Woody runs like a toy – uncoordinated, his arms and legs flailing about. And Buzz, as his stalwart character denotes, runs like an athlete. • The perennial abandonment scene (which is sad, but not on the level of TOY STORY 2) features Lotso, doll-baby and Chuckles the Clown hitching a ride on the bumper of the Pizza Planet van. • In the final scenes, the doll-baby takes the role of Vader, and Lotso the Emperor, as he is raised above the doll-baby’s head and cast into the reactor/dumpster.